In Westminster, polluting the environment and congesting the roads turns out to be cheaper! 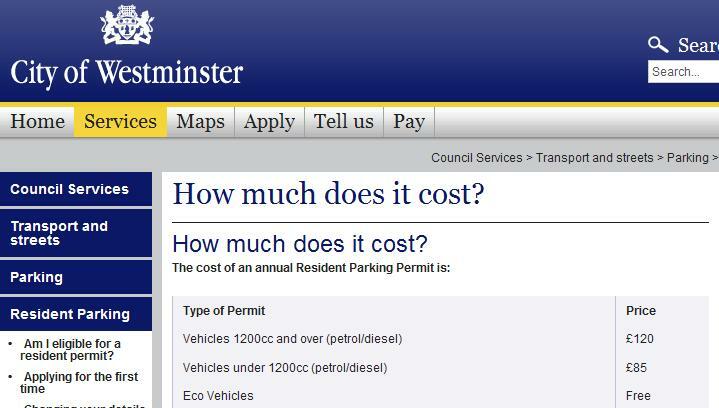 It is cheaper, for a Westminster resident, to buy an annual parking permit for a car with an engine size of up to 1,200cc than it is for a 50cc scooter. … the same annual parking permit for a motorcycle costs £100, irrespective of its engine size. So if you have a 50cc scooter, it costs a Westminster resident more to buy an annual parking permit for it than for a car of up to 24 times the scooter’s engine size! What do you think congests and pollutes more, a car with an engine size of up to 1,200cc or a 50cc scooter? Since kerb space management seems to be a real issue for Councillor Danny Chalkley, who loves to use this as an excuse to hide the true reason for the bike parking tax, that is to boost revenue to make the Partners in Parking (PiP) scheme financially more attractive to other councils, it makes perfect sense to promote the use of cars by offering residents a cheaper annual parking permit for them than for bikes, doesn’t it? Is Chalkley really that stupid or is it that he treats bikers like idiots? When the parking tax for bikes was introduced in August 2008, the cost of an annual parking permit was £150, almost twice as much as the cost of its equivalent for a car of up to 1,200cc, and 25% more than the cost of an annual parking permit for a car with an engine size of 1,200cc and above. Chalkley subsequently reduced the bike parking fare down to £100 per annum in June 2009, thinking that the massive opposition that he was facing would go away. How bloody wrong he was! To the contrary, the number of supporters to the No To Bike Parking Tax campaign continued to increase on a daily basis, to the extent that Chalkley received in excess of 3,000 formal objections to his revised bike parking fare on 1st July 2009. It’s not just the cost that bikers are opposed to, it’s also the principle of charging bikes to park which is completely wrong. Bikes don’t congest the roads, take a miniscule amount of space compared with cars, pollute far less than cars (yes, Councillor Burbridge, they bloody do!) and offer a faster, quicker and reliable mode of transport, therefore their use should be encouraged, not discouraged by a stealth tax that brings no benefits to motorcyclists. But no, Chalkley doesn’t like bikes, he seems to much prefer cars, the pollution and congestion they generate. He’s not afraid of going against common sense and promoting a policy within his own borough that contradicts the Mayor’s initiative to encourage the use of bikes in Central London. And let’s not forget that Chalkley is happy to offer himself and his fellow Conservative Councillors the benefit of a free official Westminster wide parking permit for their car, as if they couldn’t afford the cost of the annual permit he has imposed on his residents and couldn’t be bothered to use the crap Verrus pay by phone system that he keeps being so proud of. So Westminster residents, get rid of your bike, get a car, pollute, congest and get value for money by maximising the use of the Westminster kerb space. Come on guys, what are you waiting for? This is what Chalkley and his fellow Conservative Councillors want you to do! Oh, but wait a minute, Westminster will get less parking revenue if we switched to cars (of less than 1,200cc), and the PiP scheme will look less attractive to other councils, won’t it? That’s probably why the bike parking fare is (and definitely was) higher than that for a car, because the number of bikes in London is increasing at a faster rate than that of cars, because of the congestion charge, from which bikes are exempt. 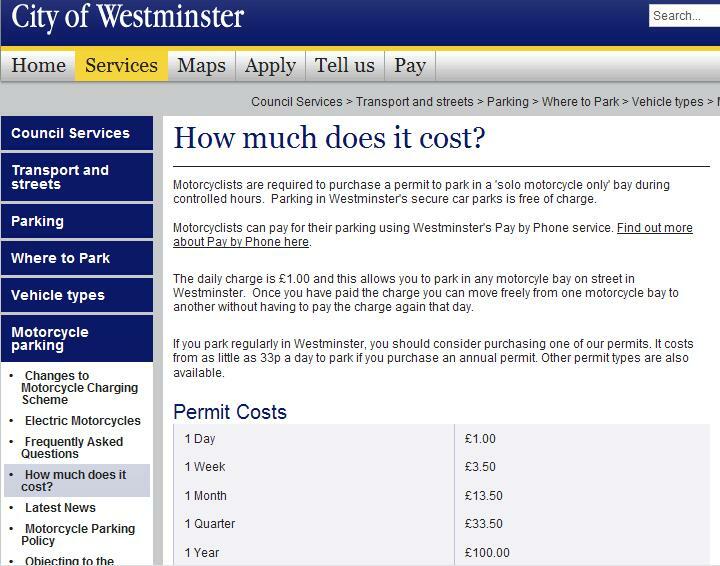 Charging for motorcycle parking is therefore nothing but a money generating scheme for Westminster City Council and their PiP scheme. So come on guys, stay on your bike and come along to the next demonstration, on 7th December 2009, to request a public inquiry into the way the PiP scheme has been set up and is running, which is very likely to uncover a series of violations of European Union law (more details here).